THERE’S a bevy of action for punters this Saturday when the Epsom Handicap, Metropolitan Handicap and Flight Stakes are run at Randwick. Hauraki has been well-supported in the Epsom and brings in a last-start placing behind champion mare Winx. The Metropolitan has attracted a good field of stayers, which will be looking towards the Caulfield and Melbourne Cups later this spring. The Flight Stakes has been decimated by the scratching of hot-favourite Omei Sword and now has only a field of six runners. Get up to $50 in bonus bets with CrownBet if your runner finishes second in any of the last four races at Randwick. Chain Of Fools opened up at $4.20, but has drifted to $4.40 despite winning a trial by 7.3 lengths earlier in September. The Waterhouse/Bott-trained filly is by More Than Ready so it will likely need a few runs to hit its best, but it can’t be ruled out based on its trial. 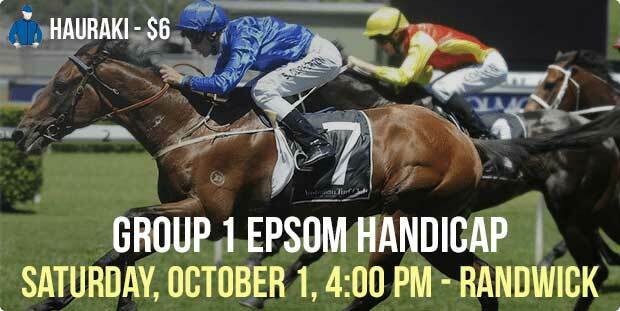 Jorda is from the powerful Godolphin stables and it also won a trial in preparation for this. The daughter of Exceed And Excel opened at $2.10 and has moved out a touch to $2.20, but expect plenty of support on the day and it looks hard to beat. Greater Good comes into this having won a trial and it’s owned by the China Horse Club, which always helps. The two-year-old is bred to run quick from the outset and the addition of Blake Shinn in the saddle will help its chances. Each way odds of $6.50 available. Godolphin release another potentially talented youngster with Piracy. The son of Exceed And Excel won a trial on September 19 and the only negative is the wide draw of 12. McDonald rides and $4.20 is a good price for a John O’Shea-trained juvenile. Condor Heroes has also drawn wide in barrier 10, but it will start at a much shorter price after a devastating trial win. The Gerald Ryan-trained colt won by 9.3 lengths in a scintillating effort and punters taking the $2.40 are confident of a repeat effort here. Trial form isn’t always a great indication come race day, but it was an impressive win. Khan was also a trial winner on September 19 and it has drawn beautifully in barrier one. The Snowden-trained colt is another from the Exceed And Excel crop which is showing no signs of slowing down. Shinn rides and punters should expect a nice run at $6 after it hit $6.50 earlier in the week. It’s Somewhat is a classy gelding which finished third behind Winx last start. The six-year-old hasn’t won for some time and punters are taking a risk at $2.10, but this field isn’t stellar and it could take advantage. Consider from the inside draw with McDonald in the saddle. Last start winner Raw Impulse returned to form with an easy 4.8-length win at Morphettville and it should be tough to beat again. The Darren Weir-trained stayer has a good record over this distance and although this is a step up in grade, it appears good enough to handle it. Chance at $2.80, but is drifting in the betting. Spiritjim opened at $4.60 and is currently at $4.20 after a solid run for fifth last start. The imported horse was good enough to run in the Arc’ and although it hasn’t shown its best in Australia, it has support and the stable is confident about its chance here. Calabasas has won only one race from six starts, but it finished close up behind Acatour last start and that form has since been franked. The Kim Waugh-trained gelding has plenty of upside and it has been backed in from $6 to $5.50. Octavian Augustus ran on well last time out which suggests the rise to the mile will suit perfectly. The Chris Waller-trained colt has attracted plenty of support at $3.50 and the inside barrier will be ideal. There isn’t much exposed form in this race and it could capitalise. Nemrud comes into this having not won a race, but it’s on the second line of betting at $4.40. The John O’Shea-trained colt had no luck behind Cross Stitch last start after getting chopped out in the straight, but this is a big step up from midweek grade. Keep in mind and watch for any betting moves. Astern is the class runner of the field and the bookmakers aren’t taking any chances with it. The John O’Shea-trained colt is a $1.60 chance after winning the Group 1 Golden Rose last start in fine style. It’s a horse going places and it looks the standout bet of the day. Golden Slipper winner Capitalist didn’t fire fresh up in the San Domenico Stakes, but a better effort is expected here. The Snowden-trained colt didn’t enjoy the rain-affected track last start and there are questions about whether or not it has returned from a tough two-year-old season, but it’s too good to leave out of calculations. Russian Revolution is an unbeaten colt from the Snowden stables which hasn’t done anything wrong to date. This is another rise in class and it hasn’t been running lightning times, but it puts itself into the race and it could battle on well for a place. Not a lot of value in the $14 for the win, but the $2.35 to place is worth a shot. Global Glamour wasn’t beaten far by Foxplay last start and the extra distance will be ideal. The Waterhouse/Bott-trained filly was a stylish winner on debut by 6.3 lengths and drawing the inside barrier will allow it to put itself in the race. Has been well backed into $4.60. Yankee Rose is the quality runner of the field and it will be looking to rebound after a disappointing run in the Golden Rose. The David Vandyke-trained filly won the Sires’ Produce at its previous start and that form will be too good for this field. Expect a much better performance and the $1.90 is a decent price for the favourite. Awoke was disappointing two back and it had no luck last time out. The Waller-trained filly defeated the highly-touted Foxplay at its second start and it will carry plenty of support into this run. $6 is available for punters which think it could rebound. Palentino won in style last start by defeating stablemate and subsequent winner Black Heart Bart. The four-year-old Makybe Diva Stakes winner is having its fourth start this campaign which is ideal and although it’s better suited left handed, it should still produce a nice effort. Currently $7 after opening at $6.50. Hauraki has produced two good performances this season by winning the Tramway Stakes before finishing only 1.3 lengths behind Winx in the George Main. That form should be taken seriously here and it wouldn’t have to improve to take this out. Drawn a touch wide, but expect McDonald to ride it well and give it every chance. Is drifting in the market, but the $6 looks like value. McCreery turned the corner with a win in the Kingston Town Stakes last start and indicated a nice spring campaign could be on the cards. The Waller-trained import was only treading water throughout the winter, but it has hit top gear now and it looks a great chance down in the weights at 51.5kg. Big threat at $5.50. Former New Zealander Antonio Giuseppe has gone to another level with Chris Waller having won its last four starts. The four-year-old was a classy 2.8-length winner last start and although this is a massive rise in class to group one level, it is well-weighted at 51kg and it could offer some cheek with Glen Boss in the saddle. Punters are liking its chances at $4.60. Fellow former Kiwi and stablemate Sacred Master was too good for its opposition in the Newcastle Cup last start and it looks set to take on the tougher rivals here. The five-year-old has won seven from 17 starts which includes its only start at this distance and dropping down to 53kg will help. It opened at $6.50 and has since drifted to $7.50, but is still a major winning chance. Who Shot Thebarman has been running on nicely and a long overdue win doesn’t look far off. Another Waller-trained runner, the eight-year-old hasn’t won for a long time, but it closed well against Hartnell last start and it has won twice at this distance. It hasn’t won at Randwick in 10 starts, but it has been well backed and is worth an each way bet at $7.50. Southern Legend wasn’t disgraced when third in the Theo Marks Stakes last start and its form prior was excellent. The Les Bridge-trained gelding put four consecutive wins together which included a win in the Darby Munro at Rosehill. The four-year-old won its only start on this track and it has been well backed into $5 with bookmakers. English was disappointing last start in The Shorts, but the race wasn’t run to suit and although it has drawn wide here, it should be tough to beat. The Waterhouse/Bott-trained mare showed its class by winning the All Aged Stakes over Black Heart Bart and having won three times at this track, English looks a great winning chance here at $2.90. Kaepernick is a five-time winner from 15 starts and it flashed home late behind Takedown in The Shorts last start. The Hawkes-trained gelding runs best at this distance and Corey Brown takes the ride. It does rise in weight, which isn’t ideal, but consider on an each way value.